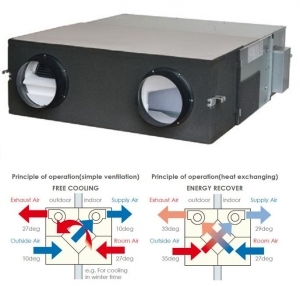 The Mitsubishi SAF350E7 heat recovery unit is suitable for larger houses and commercial premises to provide fresh air ventilation and recovery of heat from exhausted air leaving the building. Control is via the included hardwired controller which can be used to set on and off times, other features include a filter cleaning alarm to alert you when the heat exchanger filter requires cleaning. Please see the brochure below for full specifications on this ventilation and heat recovery unit.